I'm BACK!! And, I really hope to stay! :) I feel like I'm just around the corner from having all of the beginning of the year "maddeness" behind me! My goal from here on out is to post at least 2-3 times per week about activities going on in our classroom. 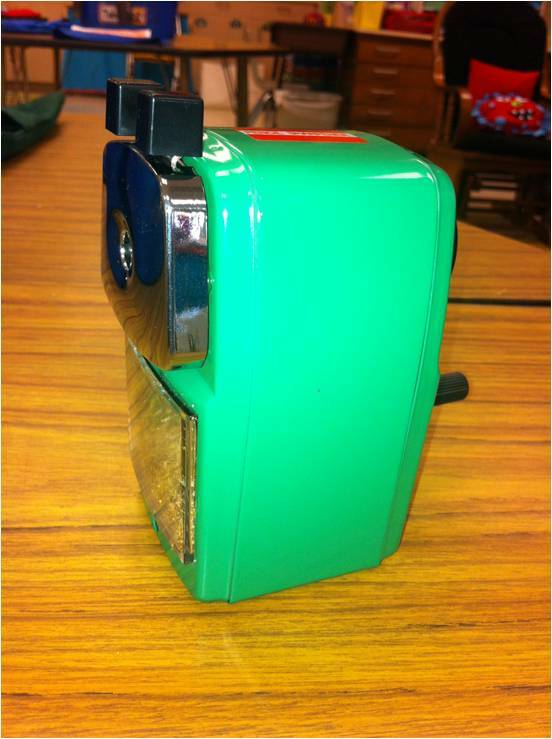 I know you have seen this little beauty on lots of blogs, but I've been saving my post about it until I could really test this sharpener out in my classroom. I am now ready to state that it really is the BEST pencil sharpener EVER!! I was a little skeptical at first because it's not electric. I mean, come on....I haven't used a manual pencil sharpener in, well....it's been so long, I can't even remember! But after reading all the raving reviews about it on other blogs, I knew I wanted to try it! It came in the mail over the summer and I just couldn't WAIT to test it out in my classroom. This is a close up of my little beauty! It comes in red, blue and green. I wanted the red, but it was sold out at the time. That just means I might need to splurge on another one! 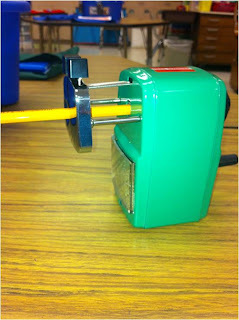 :) The pencil sharpener sits on a flat surface. It comes with a clamp to secure it to the edge of a table or cabinet, but it's just as easy to use without it being secured. EVERY - TIME!! Pencil LOVE! I was a bit hesitant even after seeing these beautiful points. I thought they may be a little TOO sharp and would break off as soon as my kiddos would apply pressure to them, but that has not been the case. They are not like the super sharp points you get with most other pencil sharpeners. They are sharp and sturdy! If you haven't tried this sharpener, I would put it on your wishlist. You know why it's so fabulous? It was invented by a TEACHER!! It's only $24.99 and worth every penny. Grab yours at http://www.classroomfriendlysupplies.com/. So now, with my new pencil set up..... Pencil (Straw) Dispenser full of sharpened pencils from my Quietest Pencil Sharpener ever, Monster-ific Dull Pencil Container, and Eraser (Gumball) Machine, I finally feel like I'm on my way to possibly the most Perfect Pencil System ever!! I love your gumball/eraser machine! Love the gumball machine and pencil holder. I have been looking for one that won't break my wallet. I love my sharpener too!! They really are great! Your pencil dispenser came out so cute! So I am thinking you should do a pencil sharpener giveaway...no? Thanks for the post, I need to get posting soon too! Love the pencil station! I have got to get the sharpener! I received mine last week to do a review! I'm in love! :-) I want to do a giveaway, but he's almost sold out of his current stock. He said possibly November. Maybe I'll be nearing 150 followers by then? We'll see! That gumball machine may be the *perfect* solution to my mini eraser woes!! I have this bad boy pencil sharpener too-- it really is amazing!! I also have this sharpener and I LOVE it! I love your eraser holder, where did you get it?? Amanda!! I love your whole setup! I can't wait to get my hands on one of those sharpeners!! I have the same pencil sharpener and LOVE it! I was not about to spend the big bucks for a nice electric one so though this one would be perfect and it was. Whoo hoo! Love, love, love the pencil dispenser! 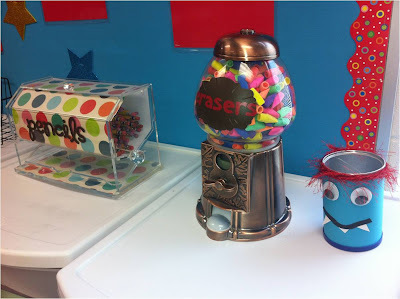 I love the pencil (straw) dispenser and the gumball eraser machine! I have got to make these! Too cute and so fun! 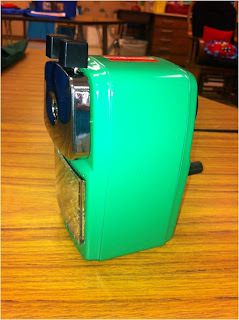 I love this pencil sharpener too!! Seriously the best points.. I love your eraser holder!! Where did you get it??? 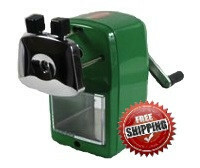 Amanda, I ordered 3 pencil sharpeners to share with friends (or maybe not!). The site was sold out of individual pencil sharpeners when I ordered.....so.....I bought the teacher bundle of 3 for 17.99/each! Couldn't resist! The eraser gumball machine is just an old "Jelly Belly" machine we had around our house. Perfect for dispensing erasers! 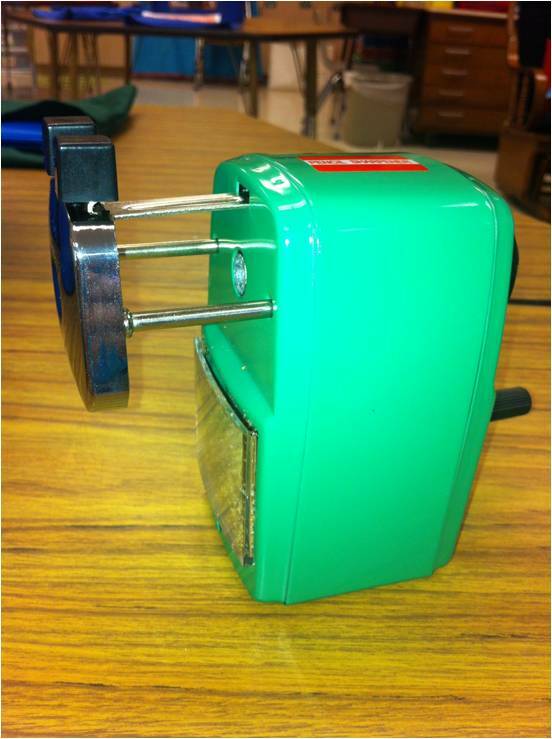 You will LOVE the sharpener and your teacher friends will LOVE you for sharing! ;) That bundle is a great deal! Love the gumball eraser system!!! Where did u pick up your awesome pencil dispenser??? I bought the sharpener...in black and then glittered it. Now, it's hot pink and adorable! On another note, I've been using it wrong! Monday will be a whole new day.